OK, this greeting is not original. I give credit to Jill, my future daughter-in-love. Clever! For the first time in 25 years or so, Bill and I will not be at our door to meet the trick-or-treaters. I can't say it's my favorite night of the year. 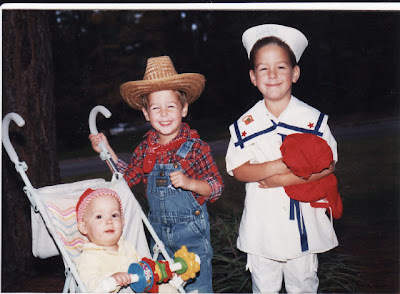 In fact, I hold many unfavorable memories of: helping frantic kids figure out costumes, usually about an hour before trick-or-treating... getting a pumpkin carved, usually about an hour before trick-or-treating... trying to get four kids to eat some dinner before trick-or-treating... traipsing the neighborhood with my kids so they wouldn't get accosted or kidnapped... consoling my son Dan, who DID get accosted by older kids who stole his candy... and not having enough candy for the trick-or-treaters. The one favorable memory is eating the kids' good candy bars while they were at school. Can you believe that? I know if you're honest, most of you moms will admit the same. So tonight, we're going out to dinner and staying out past 8 pm when the T-or-T'ers are supposed to go home. Call me a Halloween grinch. Moms and dads....you know how we try to teach our kids good sportsmanship? "Do your best, have fun, and don't worry if you win or lose." Yeah, right. Sometimes even WE could hardly stand the losses. 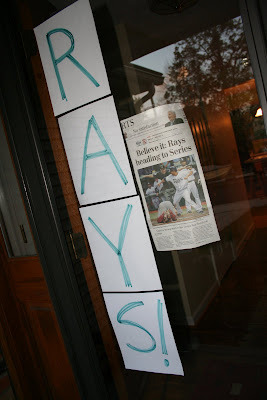 As I watched our Tampa Bay Rays go down against the Phillies last night in game 5 of the World Series, I couldn't help but remember the losses of my kids years ago. The tears. The sulking. But these were grown men, and refreshingly, they were acting like it. Disappointed, of course, but fully aware of the amazing season behind them and grateful for it. Worst to first. Beating Chicago, then Boston, then on to the World Series. Perhaps first baseman Carlos Pena summed it up best: "We're a family, because that's what we are, so even though I'm extremely disappointed, at the same time, we don't want to waste too much time focusing on that. Instead, we just say, 'Thank you God for letting us get to this point' -- where we actually were able to experience defeat in the World Series, where so many have not even done that." I'm not really a sports fan. But I am a fan of those who look at life with a proper perspective, conduct themselves with respect and walk humbly. Like the 2008 Tampa Bay Rays. My big brother Pat is lying in a hospital in Savannah, Georgia. Yesterday he had a hip replacement. ouch. He says it must be due to "Memaw genes." Memaw was our dad's mother who lived to age 92, but she always had problems with her hips. Of course, as far as I know, Memaw never golfed. (It's funny just to imagine.) Pat's a crazy golfer and in fact he and his wife Jan moved to the coast of South Carolina where they're surrounded by golf courses. So I know he's anxious for the new hip to be up and running soon....so that he can be golfing soon. 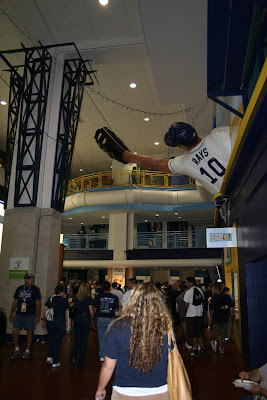 I love that name: THE TROP! I felt very hip just saying, "Beth, we're almost to the Trop!" And, "Beth! 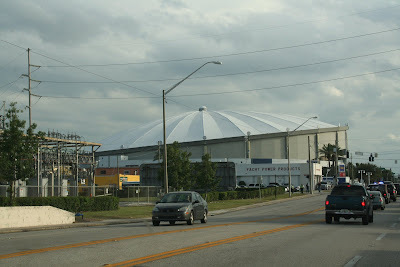 There's the Trop!" 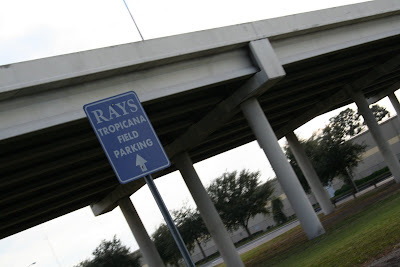 It's Tropicana Field, home of the Amazin' Tampa Bay Rays. Until I arrived, I thought an indoor ballpark in Florida was odd and how could I ever like such a thing? But it was very cool. 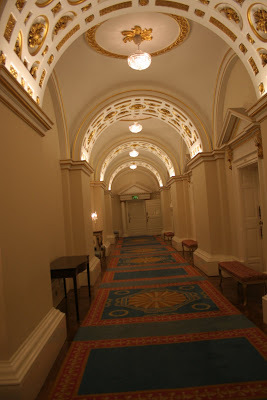 The hallways reminded me of old-style brick ballparks, with unusual things on the walls. (I read on the Rays website that the 8-story entrance to the Trop was modeled after Ebbets Field in Chicago, using 1913 blueprints!) 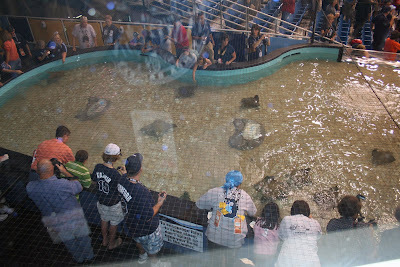 Then there's the ray tank, where you can actually pet the "cownose rays." 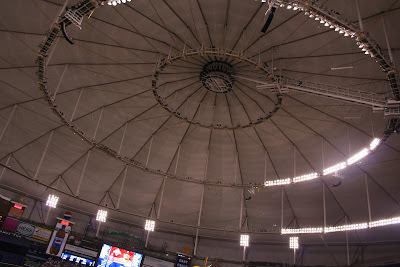 The roof of the Trop is a truly magnificent sight: it "features the world's second-largest cable-supported domed roof (Georgia Dome is the largest). It's made of six acres of translucent, Teflon-coated fiberglass and it virtually supports itself with 180 miles of cables connected by struts." (thank you, tampabay.rays.mlb.com) Don't you just love superlatives? 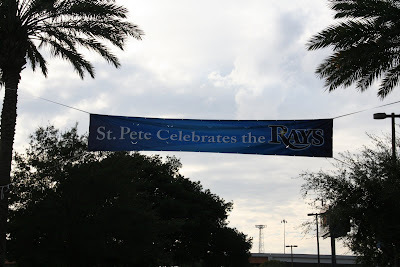 I do and I was humbled to watch two World Series games under the big Trop Top! Of course the highlight was being with David, meeting his peeps in the media area, and then spotting him in the front row of the press box. I was quite bold in trying to photograph him "on the job" and one security man warned me that "security across the park" were watching with binoculars. Am I that suspicious-looking? See the blue wall behind the guys at the desks? 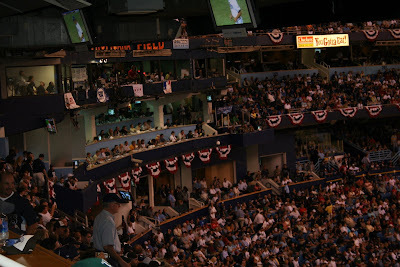 That's the press box and David's in the front row, about second from the far right. (click on pic) Yes, I promise you, that's my son! 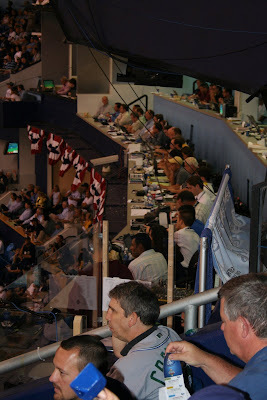 OK, here's a better photo ... David's in the foreground there in the press box. David and me before the start of game one. David's busiest time is the hours before the game ... during the World Series, about 500-600 media people were in the stadium! This question came from a jovial gentleman in the Tampa airport as I boarded a train over to the next terminal for baggage claim. He thought he was hilarious. I simply asked if the train was headed to the baggage claim area. He continued: "your husband does all the driving, right, and you don't know how to get places!" I smiled and answered, "I managed to get from Ohio to Tampa on 2 airplanes on my own and I can follow a map." As Chonda Pierce's mother used to say, "Do you want your face slapped?" Let it be a lesson. As many moms have said, "think before you speak." Use your brain before you open your mouth. 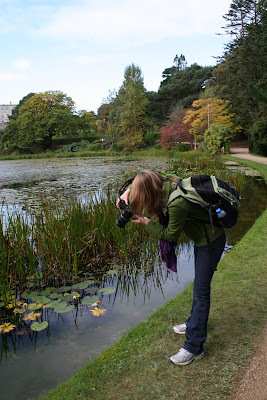 And someday I'll write about my travels with four young children, driving WITHOUT my husband for many, many miles. Never would I have dreamed of going to two World Series games. But that's what I did and it just goes to show: I can and maybe should get out of my comfy little coccoon and do wild and impetuous things. 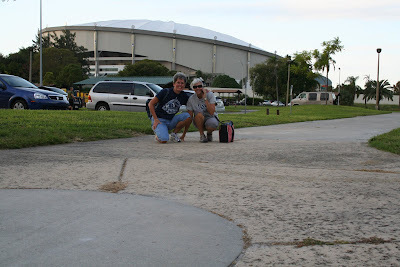 I flew to Tampa last Wednesday and thanks to my wild and impetuous friend Beth, we were at THE TROP (Tropicana Field, home of the Tampa Bay Rays) a few hours before the start of game one. David met us and though he was working and quite the busy media man, he checked in with us throughout the evening. More on this excellent adventure, but for now I'm watching game four. Go RAYS! 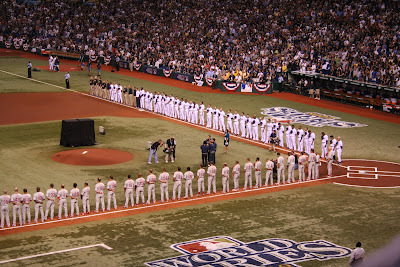 Yep, they're amazing, the young Tampa Bay Rays, winning the American League pennant in game seven on Sunday night! Now it's on to the World Series. The WORLD SERIES! (though there are never any WORLD teams in the Series...go figure.) 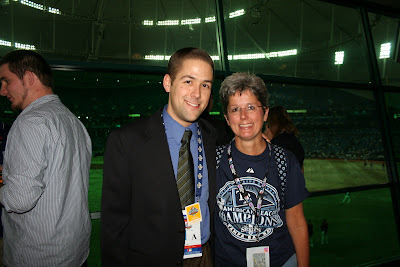 Life for my son David in the Rays' media department is insane. 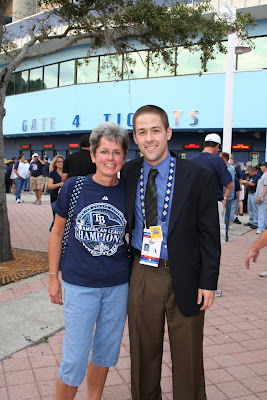 Well, mom gets to check in on him because I'm headed to Tampa tomorrow for the first 2 games! 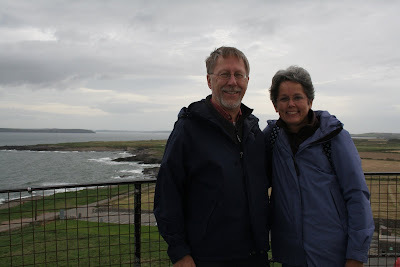 Thanks and hugs to my sweet husband, who encouraged me to go on this trip ... I'll be hanging out with my friend Beth. 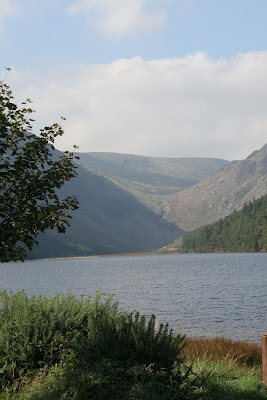 So I'm on a blog hiatus! Go RAYS!! 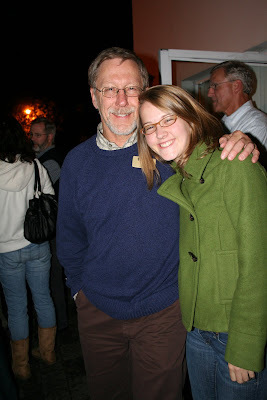 My daughter-in-love Jenny turns 24 today. I don't really know how I am old enough to have a daughter-in-love, but here we are and a year from now I'll have another! - She loves to laugh and has a sharp sense of humor. She just "gets" funny things that I get, so that's fun. - Jenny has taught me a thing or two. Like how to peel an avocado. Stupid, you don't peel it! You cut it in half, then scoop it out. NO, she never said that, she just kindly showed me and I was amazed! - She really wasn't too overwhelmed by our family with three brothers, even when they are loud and rude and annoying. That's a cool girl. - Though she's always been a "little sister" in her family, Jenny has shown she knows how to be a loving and attentive big sister to Katie. Very neat. - She says things and we talk about things that boys just don't. She never seems in a hurry to get a conversation over with. - She has good fashion sense and I don't, usually, and she is honest enough to gently help me in this area. - Jenny loves books, coffee and God and what could be better than that? - She is a giver. Of special gifts, time, friendship and love. - Jenny loves my son Dan, and that makes me very happy. I'm thankful for you and I love you, Jenny, and I wish you a most excellent birthday! How did the week pass so quickly? 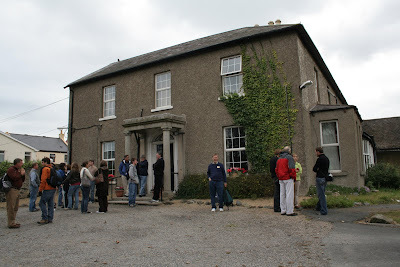 Great fellowship with the kids and Taylor parents, a different glimpse into Ireland every day, and no cooking! 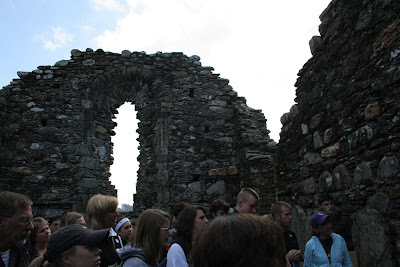 On this final day in Ireland, we gathered at the 'Y' at 9:00 to join the students for a day in Dublin. Some stayed back, including Bill, who was ready for a little down time. 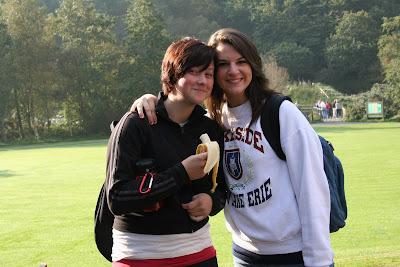 Tal, Katie and I teamed up and headed for the DART into Dublin with many other parents & students. 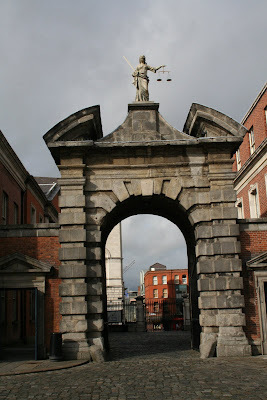 A gate leading into Dublin Castle, built in the year 1204. Inside the amazing Dublin castle...we took a very interesting tour of this castle that continues to serve as a government building. Also fascinating was seeing the underground excavation of the original castle and city walls. 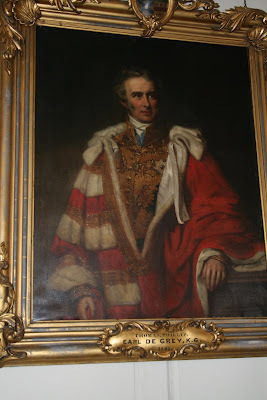 ...for you tea lovers, here he is: Sir Earl Grey! 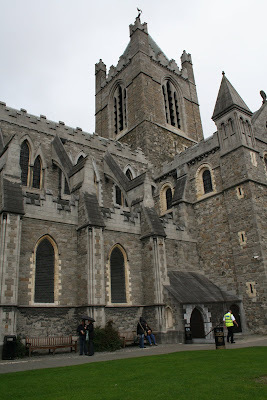 Christ Church Cathedral, just a short walk from the castle. 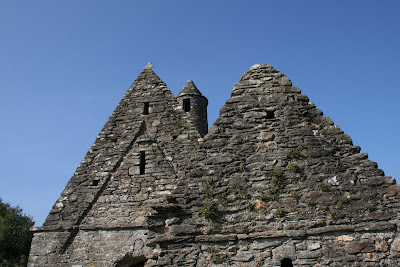 Built in 1030! 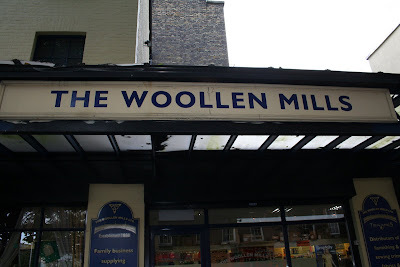 Paid a visit to this little shop in Dublin to get some Irish "woollen" yarn for my friend Lynn. The real place for local knitters ... not so much tourists. Katie hugs Bill goodbye after our final dinner. 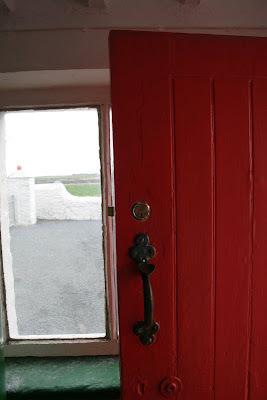 And so the door closes on our visit to Ireland. It's a land of warm people and breathtaking scenery, yet I felt at home at every turn. A part of my heart remains and I hope to return and explore the incomparable west coast. It was especially wonderful to see Katie and how she is thriving as she is stretched in travel, discoveries, new friends and the independence of college life. We are proud, PROUD of you, Katie! Today was long. Bus-riding long, but fun and fascinating. 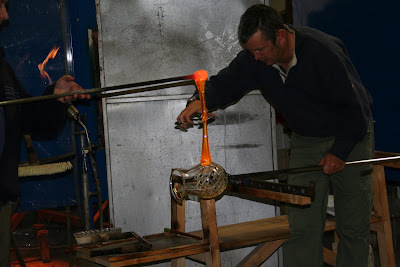 We left Bray at 6:45 a.m. for the 3-hour journey south to Waterford for a tour of the crystal factory. 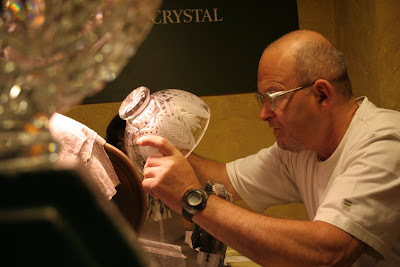 These guys know their stuff: the top craftsmen spend 10 years in training. 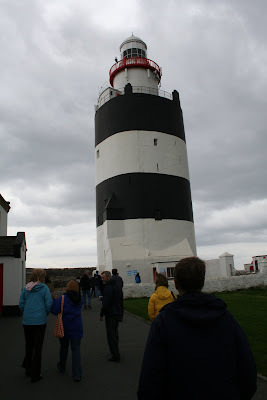 Following the factory tour and lunch, it was on to the Hook lighthouse. I'm a sucker for lighthouses, so for me this was the highlight of the day, Monday, Sept. 29. 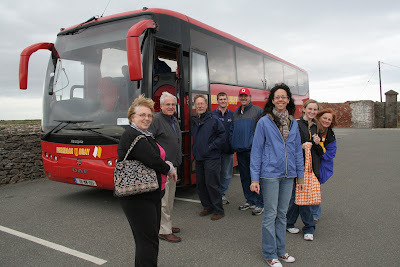 By now we've figured out that our bus driver, Brian, could offer up endless tales and explanations of all things Irish. 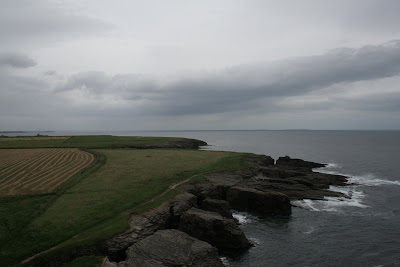 Today he told us that the expression, "by hook or by crook" originated in the area of the Hook lighthouse and the nearby village of Crook ... something to do with invaders. Plausible. 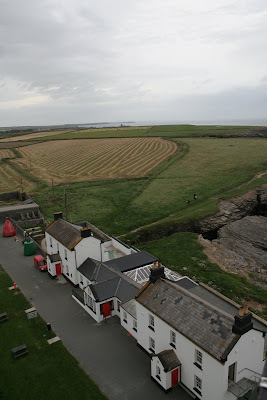 But memorable to me is that we visited one of the oldest still-in-use lighthouses in the world. We're talking 13th century here. 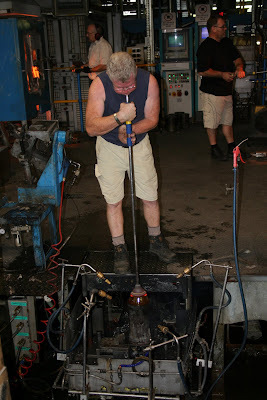 This guy is blowing and molding the liquid glass into a vase. And now they're putting a handle on a pitcher. They make it look so easy. Now for the etching, done with wheels. Each piece must be perfect. 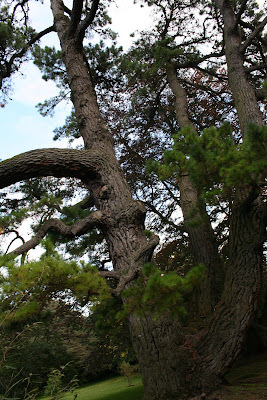 If a craftsman turns out an imperfect one or breaks a piece, he isn't paid for his work on it. 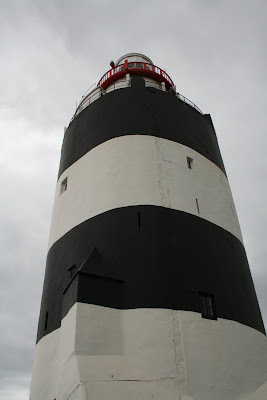 Solid and silent and strong: the Hook Lighthouse! A most unique design. 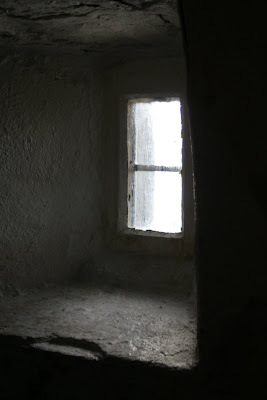 Imagine three domed rooms stacked upon each other, accessed by stairs along the outside walls of the lighthouse. 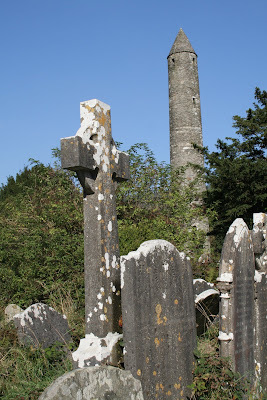 Originally, monks occupied it ... later, a lighthouse keeper and his family. 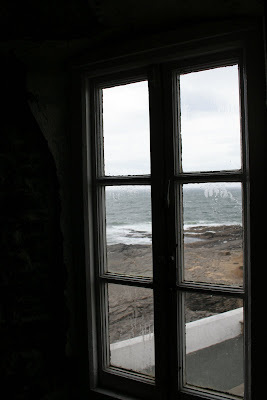 Damp and chilly, the lighthouse was heated only by small fireplaces in each room. People have been seeing this view for almost 800 years. Well, not the cars. 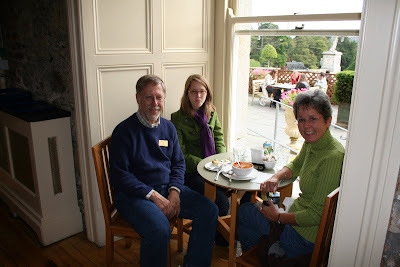 After our tour, we enjoyed scones and tea inside the visitor centre. 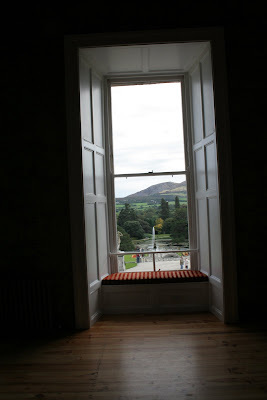 We returned to Greystones to have dessert with our students, who then entertained us with skits on Irish history. A long and good day. 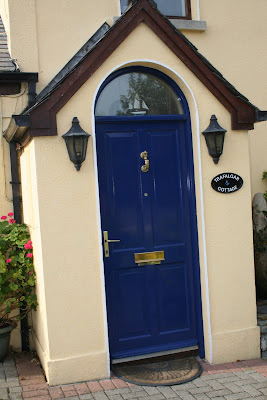 On Sunday morning we arrived at the Y to join the students for church: students are encouraged to worship wherever they choose in Greystones and Katie took us to Hillside Church, full of faith and spirit. 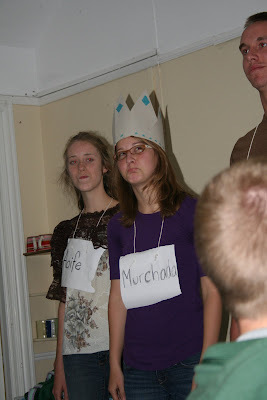 A young woman spoke on her mission in Kenya, where she ministers to young men who are addicted to glue-sniffing. Powerful testimony. A fire gutted the house in 1974, leaving it a shell for 20 years. 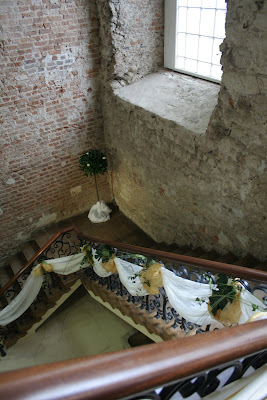 A restoration was begun in 1996, bringing the house back to function and beauty. 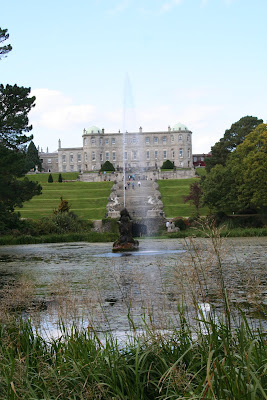 Bill, Katie and I lunching at Powerscourt. 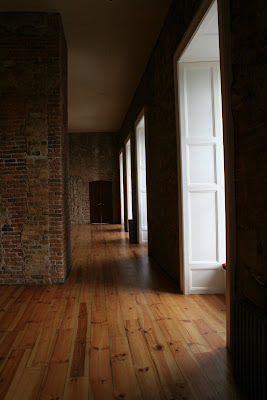 Windows and light fascinate me ... here you see the second floor of Powerscourt ... unfurnished and now used for receptions and corporate events. 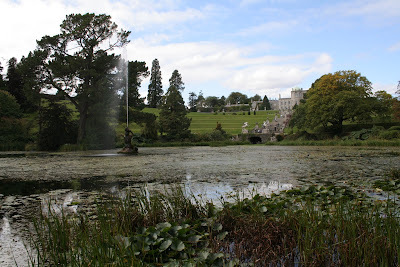 Looking back at the mansion from the far side of Triton Lake.. 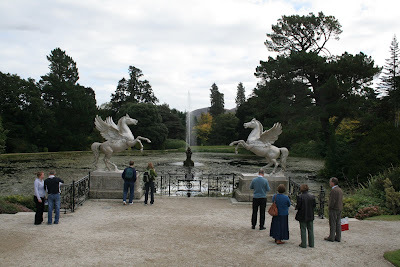 The fountain is based on the one in the Piazza Barberrini in Rome. There she is again ... Katie doing what she loves to do. 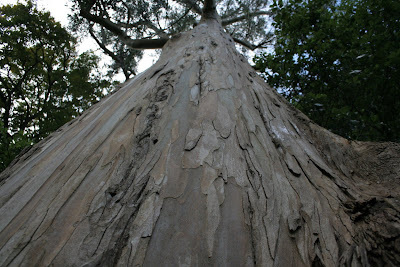 Another biggie: a eucalyptus ... don't they belong in Australia?? 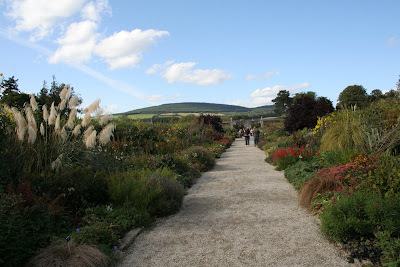 for my gardening friends ... take a look. 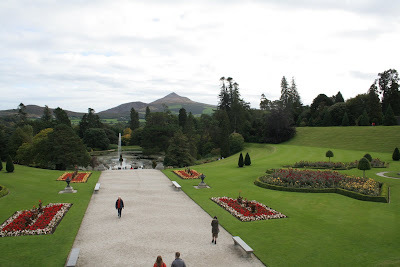 Impressive gardens at Powerscourt! Back in Greystones, Katie and I walked into town and bought "take-away," the Irish term for take-out ... fish & chips for me and Chinese for Katie and Bill! I'm really, really, really NOT a sports fan. Trouble is, our empty-nest lives right now are all a jumble from travels-in-Europe, October baseball ("there's only ONE October") and racing the weather to shut down our cabin 400 miles north of here. So. Rays lose at 12:30 a.m. I'm thinking we'll get in the car this morning and drive north. No, no - Bill can't bear to miss game 6 of the ALCS tomorrow night. And neither can I. (No cable in Michigan) And - heaven forbid - possibly a 7th game Sunday night to see just who gets to go to the Series. I hope the temps don't dip and freeze the pipes before we get up there. Like I said, I'm not a sports fan. 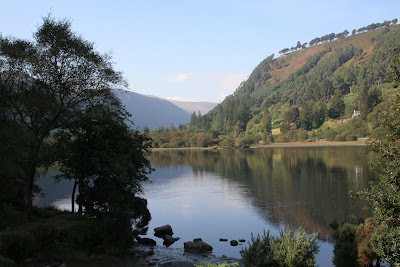 After packing bag lunches at the 'Y' with the students, we boarded buses for a short drive to Wicklow National Park. 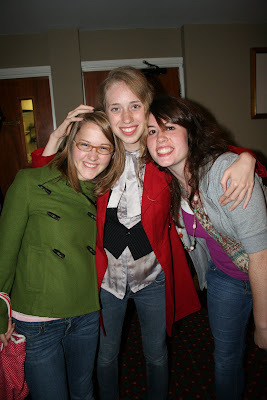 Hannah and Chelsea....Katie's 2 roommates for the week she was at Taylor in August. We were so blessed throughout the week to spend time with all these awesome kids! 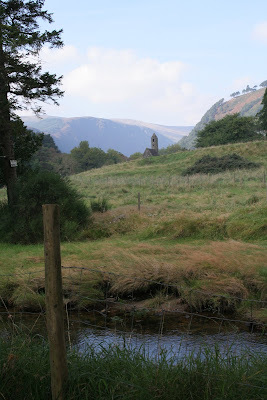 The monastic site of Glendalough, begun in the 6th century by a fellow named St. Kevin. 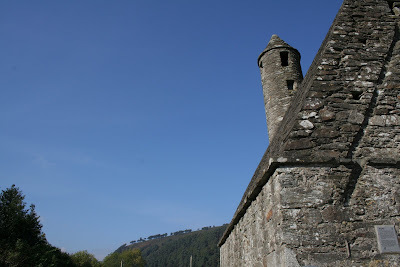 The round tower at Glendalough is not unique in Ireland: there are many around the country. 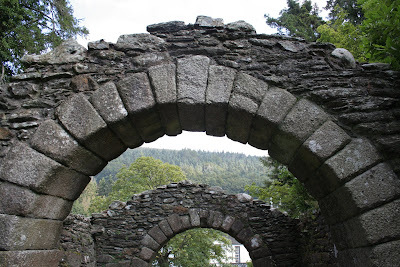 There is no definitive reason they were built, but one theory is that they served as a focal point for early pilgrims making their way to worship. 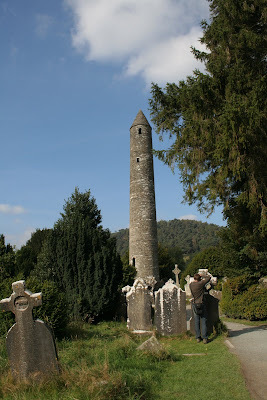 This round tower is about 30 meters tall. 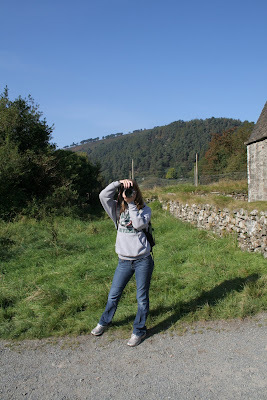 Photographing the photographer ... Katie at Glendalough. ... hiking another 15 minutes, we came to the upper lake. Spectacular! 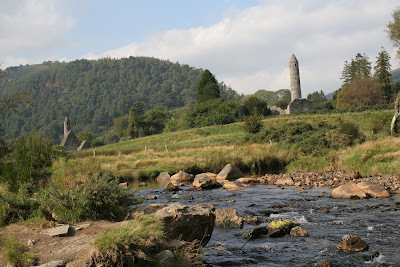 Taking a different trail down from the lakes brought us to this postcard-perfect view of the monastery, round tower and beautiful stream. 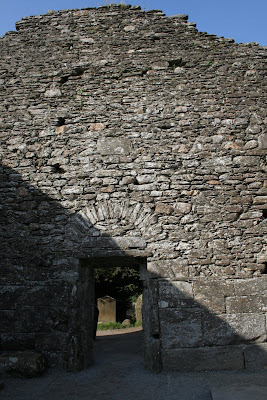 A great ending to a gorgeous day in the countryside of Ireland, discovering a piece of her history. This is a typical scene of the week: parents and students waiting around the Y: for each other or a bus ... and using the time to visit. The day was far from over ... after catching our breath at the hotel, it was off to Dublin for a group dinner ... then to the National Concert Hall for a "showband" concert.